At predetermined times during the trading week economic data is released that can immediately impact the markets bringing spikes in liquidity and volatility. 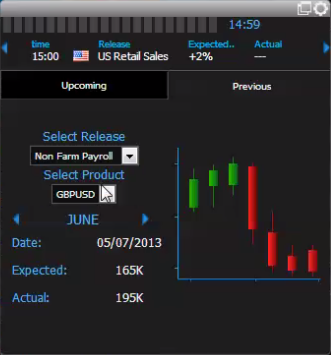 One only needs to look at the reaction of the British pound to the June Nonfarm Payroll number, which came out at an improved 195k compared to an expected 165k. 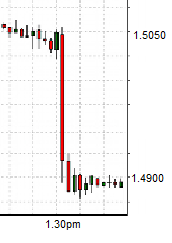 The 10 minutes following the number saw GBPUSD drop a whopping 150 pips. For traders, moves like this can be a great opportunity to make a few quid, likewise, to get cleaned out if you’re not paying attention. 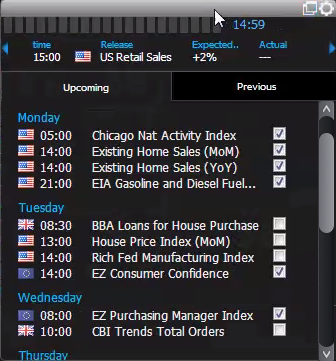 Having spent several years trading futures, often getting run over by unexpected spikes, I can appreciate the importance of staying on top of the exact times these economic indicators are released. Traditionally trading floors will have a newsreader responsible for reminding floor members of such news, many desks will also utilise Reuters or Bloomberg terminals to this end, but these can cost in excess of £20k a year. Even with these luxuries, one is still not immune to occasionally being caught off guard by an unexpected figure. So, I often thought that having a tool to monitor such releases would be invaluable to market participants who frequently enter and exit positions throughout the trading day, enabling them to reduce flash losses and increase opportunities for quick profits. Here at Caplin Hackday is an opportunity for programmers to get into small teams and produce a piece of software based on a given topic within 24 hours. This Hackday’s theme was “Bladify you dreams” –we had to introduce a new workflow into Caplin Trader. My team consisted of Kane Gregory (front-end devleloper), Nick Thronicroft (server side developer) and myself (half-baked developer). We set to it to create a blade that would serve as an alarm clock to remind traders of upcoming numbers as well as providing details of each release. If I had my way it would been called DYFO, being an acronym for “Delete Your F****ng Orders” which is what our crass risk manager would scream out moments before a major economic release. But a more business-friendly name is the “The Release Watcher”. The client side used the Bladerunner framework, Caplin Platform was utilised to scrape information from various sources on the web for the release information and previous market reactions. 1. Notify users of pending releases. Above we can see the docked version of DYFO, here the user can use the arrows to navigate through upcoming releases and review releases from earlier in the day. A bell rings to signify an imminent number and the countdown timer counts down from 20. 2. Allow users to choose which releases they care about. Here, in the undocked version, within this floating dialog the user can scan through the releases coming up for the week and select the ones that are of interest. 3. Scan through previous releases and view how markets reacted. This tab allows the trader to supplement his strategy for a given release by looking at how markets previously reacted to given outcomes. This tool would have saved me from a few fairly hefty losses due to missing figures– and saved my newsreader the inevitable cacophony of abuse as I sulked out of the office (abuse I actually muttered under my breath while his back was turned, after all, our newsreader was a couple of inches taller than me). In my humble opinion the blade we created would be a huge boon to any intraday trader and extremely useful for most market participants. And, if we’re to believe the trickle-down theory, any extra returns made from such a tool will ultimately prop up retailers of red braces and powder cocaine, the cornerstones of a healthy economy. A short video of our application can be viewed here. Our team was very happy to achieve 3rd place with the “The Release Watcher”. We were even happier to feel a moral achievement as the teams taking 1st and 2nd were embroiled with rumours of vote tampering, judge bribing and steroid abuse. (Disclaimer – these rumours may have no factual grounding and may also have been started by the writer of this blog).